BOCA RATON, FL (March 26, 2013)— Saks Fifth Avenue in Town Center at Boca Raton hosted a private luncheon featuring world-renowned home accessories designer Jay Strongwater to benefit the Nat King Cole Generation Hope (NKCGH). Saks Fifth Avenue General Manager John Antonini, along with Timolin and Casey Cole, twin daughters of the Nat King Cole who founded NKCGH, welcomed guests to the “Shop For Charity” fundraising event to support NKCGH’s mission of providing music education in South Florida schools with the goal of inspiring our youth while enriching their lives through the power of music. globally renowned brand during which he shared anecdotes on the expansion of his designs from jewelry to home accessories. He also displayed his latest designs and creations from jewelry, jewelry boxes, clocks, home décor and picture frames to other handcrafted items. 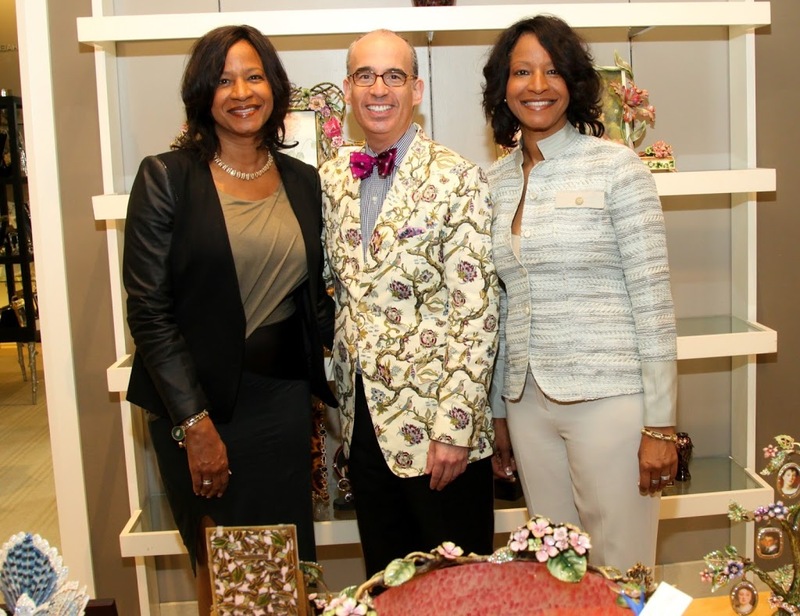 At the conclusion of the event, Strongwater signed all pieces purchased by the 50 luncheon attendees; to encourage more “shop for charity” proceeds, Saks Fifth Avenue donated 10% of all purchases made throughout the store that day by the 50 attendees to NKCGH. The mission of Nat King Cole Generation Hope, Inc., a 501(c)(3) non-profit organization, is to provide music education to children with the greatest need and fewest resources. It is accomplished by funding programs that provide for instruction, mentoring and resources. Their vision is that Nat King Cole’s unforgettable legacy will ensure future generations are given the opportunity to learn and experience the joy of music. NKCGH accepts grant applications throughout the year, which are reviewed by its Board of Directors and grants are awarded twice yearly based on the merit of application and availability of funds. Under Casey and Timolin’s passionate leadership, Nat King Cole Generation Hope, Inc., to date, has benefited more than 5,000 children in music programs in Palm Beach, Broward and Miami-Dade counties. Earlier in the month, the GENERATIONS concert, the organization’s largest annual fundraiser, raised more than $170,000. Those funds will significantly catapult the reach and response of NKCGH in granting much needed resources that have been dramatically depleted at area schools. Since its inception, the NKCGH has granted funds to several Palm Beach County schools and programs including Boca Raton Middle School, Boca Raton Community High School, Belvedere Elementary School, Canal Point Elementary School, Cholee Lake Elementary School, Forest Hill Community High School, Jaega Middle School, North Palm Beach Elementary School, Plumosa Elementary School of the Arts, Summer Strings at Lynn University, Roosevelt Community Middle School, U. B. Kinsey Elementary School, and the Youth Orchestra of Palm Beach County. Those in Broward County receiving funds include Dillard High School and Piper High School, with those in Miami-Dade County including American Senior High School, Heritage Elementary School, New World School of the Performing Arts, Northwest Miami Senior High School, and Palmetto Elementary School. For more information or to make a donation, please visit natkingcolefoundation.org, call 561-213-8209 or email info@natkingcolefoundation.org.